The previous few weeks or so, I had spent a large amount of time playtesting Standard vs Reid Duke on Magic Workstation (since Mirrodin Besieged wasn’t arriving onto Magic Online). Reid was pretty sold on UB but also said Valakut was a pretty good choice in his opinion. I couldn’t get any of my non-Valakut brews to beat Valakut often enough for my taste, so I just decided to run with it. 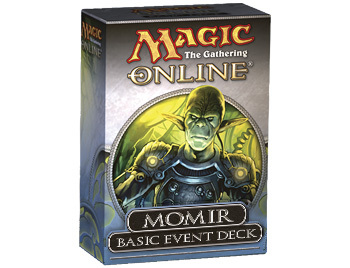 With the newfound popularity of the Momir Basic format, it’s worth taking a closer look at the metagame on MTGO. There are a couple of popular decklists out there, and we’ll be taking a closer look at some of them that we saw played in recent Momir DE’s. I’ve decided to switch gears, since for most people, the next relevant Constructed format will be Extended. For those of you who do not remember, Extended used to be a very different beast. When I first started playing, Extended was Tempest -> Mirrodin, with a significant banlist to keep Urza Block in check. Now Extended is Lorwyn -> Scars of Mirrodin with M10 and M11 as legal core sets. As a result, a lot of reasonable Extended decks will be the old Standard decks of these past three years, with a chance for innovation by looking for cross-block synergy. I’ll start by considering what I think are reasonable lists for major archetypes, and discuss what other cards could be considered. For those of you who do not know, recently deckcheck.net has gone down. In its place, I hope to provide a reasonable summary of Standard decks (and perhaps other formats) for GoodGamery by presenting five decks per week, and possible variations of them. This week we have Naya Shaman, Valakut Ramp with Genesis Wave, Monoblue-midrange, White-Weenie Relic, UB-Control, and 3 color Counterbalance/Top. The week before States, there was a large tournament in New York City which would pretty much dictate the decks to beat for States. After looking at the top 16 decks, 1st and 2nd were both Ramp decks (1st was Valakut and 2nd was Eldrazi). 3rd and 4th were Elves and UR Control (Destructive Force variety), 5th-8th were Eldrazi Ramp, Valakut Ramp, UW Control, and Eldrazi Ramp. 9th-16th had 2 UW Control, 2 Valakut Ramp, 1 UGr Shaman, 1 Bant Shaman, 1 WW-Relic, and 1 Eldrazi Ramp. All of this led me to believe that MonoRed would be a very good choice for States, since it had a pretty good matchup vs Ramp-based decks (especially boarding Mark of Mutiny/Threaten effects) and it had a reasonable matchup vs other aggro decks (which are always popular). UW control, depending on the build, could be a 50/50 matchup or nigh-unwinnable. This is a much more sane draft format than the previous two, so I recommend sticking to two colors with possibly a splash in draft. One topic that is not often covered in articles about constructed is how to properly mulligan with decks, and what factors to consider while mulliganing. However, I feel the best way to approach a discussion of this is through examples. After doing virtually no playtesting the week before, and playing in 2 GPTs with Faeries going 0-1 and 1-1, I decided it was time to switch decks. Looking at the Kobe coverage, the Kithkin deck seemed to be a very solid beatdown deck with its only fault being a lack of reach. Attending the SCG 5k, I knew that I didn’t want to play Faeries, because the mirror was way too random for my tastes, and I had been doing well with Elves in modo 8mans. I came to the conclusion that the following list was probably very good, and is what I ended up registering for the 5k.